The Eighteenth Judicial District Commission on Judicial Performance, by a vote of 7 to 3, recommends that Elizabeth Beebe Volz BE RETAINED. Judge Volz earned her undergraduate B.A. degree from Hartwick College (1976) and her Juris Doctorate degree from Albany Law School of Union University (1979). Prior to becoming a judge for the 18th Judicial District, Judge Volz was Senior Counsel at Campbell Killin Brittan & Ray, LLC, where much of her practice was dedicated to litigating on behalf of business owners, including commercial landlord-tenant issues, contract disputes, criminal defense and employment matters. Judge Volz also worked as a public defender for four years and as a prosecutor for fifteen years. She is an active member of her local rotary club and has volunteered with the Denver Indian Center and Project Cure. Judge Volz presently presides over a mixed docket, including 70% criminal, 29% Civil, and 1% Domestic Relations. Judge Elizabeth B. Volz received an overall combined average grade of 3.30 out of 4.0 in the 2014 Judicial Performance Survey, which is equal to a “B” letter grade. Based upon survey data collected in 2012 and 2013, Judge Volz’s average grades per year from both attorneys and non-attorneys have declined slightly from a combined 3.57 in 2012 to 3.13 in 2013. Fifty-eight attorneys responded to the survey, and from that sample size of attorneys, Judge Volz received below average marks in case management, application and knowledge of the law, communications, demeanor and diligence. Although Judge Volz’s scores are below average in some categories, attorney and non-attorneys stated Judge Volz’s demeanor is equally pleasant to all parties. The commission feels the need to implement an improvement plan for Judge Volz as a result of the low survey results from attorneys, in which Judge Volz has agreed to participate. Judge Volz is a relatively new judge; she has been a judge for three years. She is extremely proactive in improving her performance on the bench. The commission anticipates she will address the issues revealed in her recent survey and will become an excellent judge. 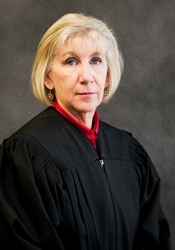 In addition to being placed on an improvement plan, Judge Volz will voluntarily participate in periodic video recording to assess her courtroom demeanor, seek guidance from senior judges when necessary, and improve her understanding of the law by continuing to do her own research and writing.